This column originally was published in the July edition of Editor & Publisher Magazine and is being reprinted with permission. To subscribe to the magazine so you can see the full array of industry coverage when it first appears in print, click here. One of the biggest challenges for newspapers in the age of interactive media is proving that their advertising works. The San Diego Union Tribune seems to have solved that problem in a small, but meaningful, way – and added an extra $100,000 per week to its gross advertising revenues. The idea sounds like a winner for other papers, too. The U-T jumped on the social-shopping bandwagon, featuring daily deals in print and on its website for everything from restaurants to summer camps. The deals don’t just offer discounts of 50% or more on gift certificates for products and services. They also encourage readers to enhance their savings by recruiting friends to buy certificates, giving a participant a $10 credit toward her next certificate for every friend she recruits to the network. Thus, the paper has created a virtuous circle: Readers who love the deals tell friends, who tell friends…and so it goes. Advertisers love not only the immediate, measurable response but also the welcome jolt of cash that flows into their coffers almost overnight. And the newspaper fattens its top line while unequivocally demonstrating its marketing clout to merchants. Hodges freely admits that he cribbed the idea from Groupon, the original social-shopping network. Coming out of nowhere, sales at Groupon were reported to be $100 million in January of 2010, or 100 times better than its performance 12 months earlier. Living Social, an imitator that launched about half a year after Groupon, rapidly caught up. Today the two companies account for approximately 98% of the online group-buying business. While the success of the online leaders might seem to leave newspapers as marginal participants in the space, remember that publishers have an advantage that online guys don’t: Concentrated local market reach and the biggest, best-connected ad staffs in every town. Seeing the same opportunity as San Diego, a number of newspapers have begun offering social-buying opportunities, printable coupons or a combination of both. Websites from the Washington Post to the San Francisco Chronicle – and dozens of points in between – promote daily deals. Jumping in with both feet, the Wilmington (DE) News Journal uses a prominent refer on the front page of its website to send visitors to half-off coupons for restaurants, plumbers, tanning parlors, garage-floor refinishers, day spas and a liposuction clinic. It even offers discount tickets for the Georgia Aquarium in Atlanta, which is 745 miles away. Papers like the Omaha World-Herald aren’t in the deal business yet, but they are actively evaluating vendors, according to Pat Lazure, the president of its interactive group. While many newspapers teamed with one of the established online players to get into the social-shopping business, San Diego decided to create its own brand. “We felt we should own this ourselves,” said Hodges. After shopping around for a technology vendor, the U-T partnered with Shoutback.Com, an Ohio-based company that provides credit-card clearing and other back-end services that the newspaper didn’t want to reinvent. The paper offers deals on Tuesday, Wednesday and Thursday, plus a weekend deal that runs from Friday through Sunday. While the U-T started by offering only a single deal a day, it probably will add a second deal in coming months, said Hodges. An advertiser pays nothing for the prominent promotion of his offer on the front page of the newspaper, the front page of the website and throughout the website. When the clock strikes midnight at the end of each deal period, the deal expires and the newspaper runs the credit cards of all the customers who have purchased gift certificates. The merchant gets half of the revenue and the newspaper keeps the other half, from which it covers sales commissions and fees to the tech vendor. Beyond building a nifty revenue stream for itself, the newspaper is building buzz. “Thirty percent of our sales come from referrals from existing customers,” said Hodges, adding that he amassed a database of 15,000 email addresses within two months of launch. Emails tout each new offer. 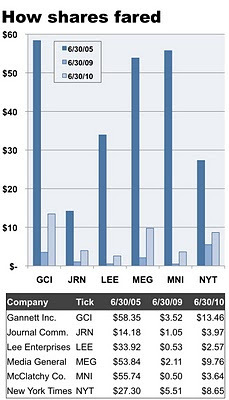 Although the shares of the publicly traded newspaper companies have advanced impressively from their all-time lows 12 months ago, they still are worth on average about a fifth of their value on June 30, 2005. The good news for the battered publishing sector is that publicly held newspaper shares rose by an average of 332% in the 12 months ended on June 30 – handily surpassing the 12% gain in the same period of the Standard & Poor’s average of 500 stocks. :: By drastically cutting staff, newsprint consumption and other expenses, newspapers were able to improve their profitability in spite of a 28.6% plunge in advertising sales in 2009.
:: Though several of the publicly held companies were heavily burdened with debt assumed in the days when the potential for future growth seemed unlimited, they all managed to stay out of bankruptcy court at the same time nine of their privately owned peers sought refuge in Chapter 11.
:: The immediate future for the business does not appear to be as gloomy as it seemed last year, when such iconic papers as the Rocky Mountain News and Seattle Post-Intelligencer shut their doors. This in part may be because newspapers stopped writing stories about how bad their business was. Taken together, the above factors evidently persuaded bargain-hunting investors to accumulate newspaper shares at a fraction of their historic value in the hopes of profiting as they bounced back. Thus, it could be argued that the run-up in newspaper shares represents more of a trading phenomenon than an expansive vote of confidence in the future of the industry. This thesis is supported by the fact that newspaper shares, despite the impressive rebound in the last 12 months, remain well short of the record peaks they hit as recently as five years ago. One reason for the continued depressed state of the shares undoubtedly has to be uncertainty about whether the global economy will pull itself out of the worst recession since the 1930s. But another may be that investors remain to be convinced that newspaper publishers know how to replicate the predictable revenue growth and enviable profitability they enjoyed in the days prior to the explosion of the digital media. 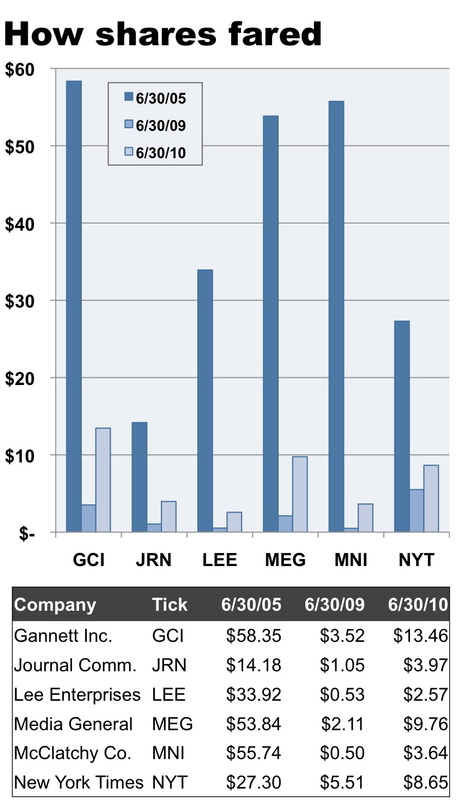 For the purposes of this analysis, I looked at the shares of six companies that have continued to derive the preponderance of their revenues from newspapers since 2005. The companies are Gannett, Journal Communications, Lee Enterprises, Media General, McClatchy and the New York Times Co. I left out GateHouse Media because it did not go public until 2006 and I eliminated A.H. Belo and E.W. Scripps because they each spun off their non-newspaper assets in 2008. News Corp. and Washington Post Co. were omitted because they do not derive the bulk of their sales from newspapers.